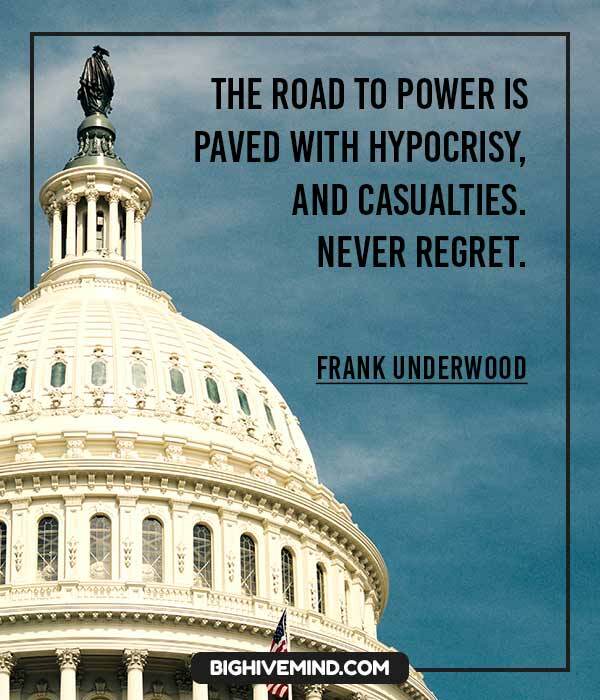 Frank Underwood, the scheming fictional politician played by Kevin Spacey on House of Cards, is not exactly a role model. Though his character is powerful, his methods are questionable. The character uses the people around him to his own ends and does not seem to have any regrets about it. Frank Underwood is from Gaffney, South Carolina. This is a real place, and featured in several episodes, including the first episode of Season 3. 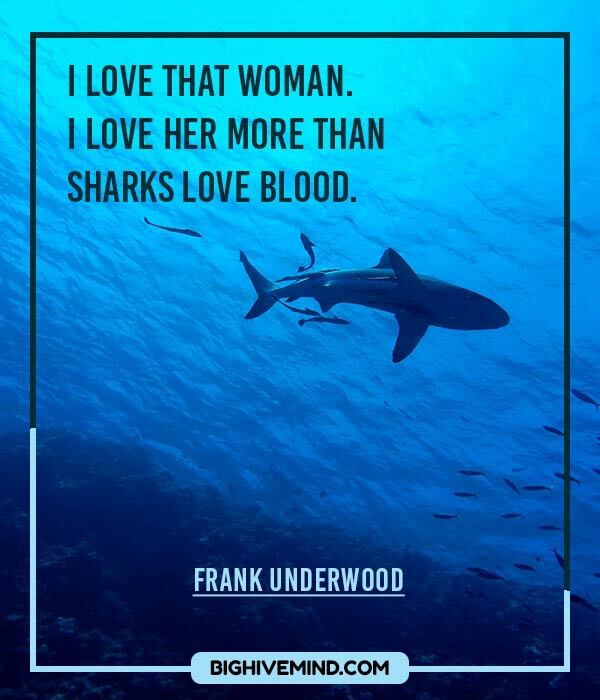 Frank Underwood’s dialogue can be motivational for people who are looking for more effectiveness in their lives. You will find these quotes inspirational if you are in business or politics. 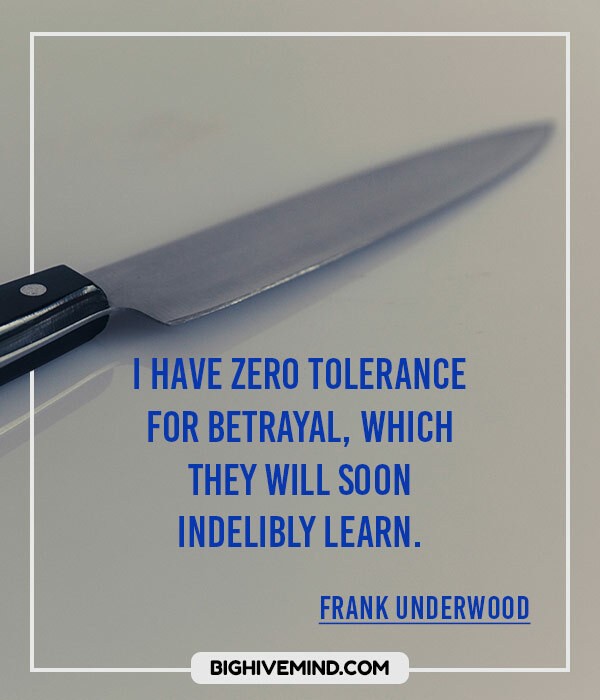 I have zero tolerance for betrayal, which they will soon indelibly learn. You have to respect your own mortality. When the money’s coming your way, you don’t ask questions. That’s how you devour a whale … one bite at a time. Pay attention to the fine print. It’s far more important than the selling price. 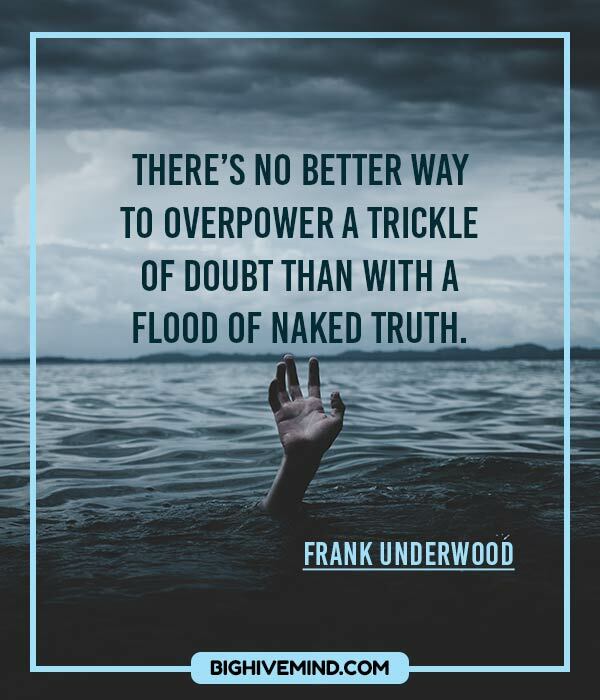 There’s no better way to overpower a trickle of doubt than with a flood of naked truth. Power is my food. Combat is my sleep. Blood is my oxygen. Politics is my blood. Sleep is my enemy. My enemies are my food. You guessed it; I still hate children. Conscience has an unmistakable stink to it — kind of like onions and morning breath. But a lie stinks even more when it’s coming from someone who isn’t used to lying — it’s more like rotten eggs and horse sh*t.
I’ll tell you this though, Pop. When they bury me, it won’t be in my backyard. And when they pay their respects, they’ll have to wait in line. I will not allow you to become dangerous. I hear silence, I don’t like that sound. I’d push him down the stairs and light his broken body on fire just to watch it burn if it wouldn’t start a world war. First, you must learn to pull an oar. Only then can you take the helm. Every Tuesday I sit down with the speaker and the majority leader to discuss the week’s agenda. Well, ‘discuss’ is probably the wrong word… they talk while I imagine their lightly-salted faces frying in a skillet. Freddy believes if a fridge falls off a minivan, you better swerve out of the way; I believe that it is the fridge’s job to swerve out of mine. I’ve never thought higher of her than I do in this moment. She lost, but she played to win. The president is like a lone tree in an empty field: he leans whichever way the wind is blowing. You can’t purchase loyalty Raymond. Not the sort I have in mind. If you want to earn my loyalty then you have to offer yours in return. And if we can agree to that – well, you’re a man with imagination. I will not be a placeholder president, Claire. I will win and I will leave a legacy. I have often found that bleeding hearts have an ironic fear of their own blood. If we never did anything we shouldn’t do, we’d never feel good about doing the things we should. From this moment on you are a rock. You absorb nothing, you say nothing, and nothing breaks you. Nobody’s a Boy Scout. Not even Boy Scouts. Even though I am an adult man, I enjoy video games. There is no solace above or below. Only us – small, solitary, striving, battling one another. I pray to myself, for myself. This is the part where you leave. Do you think I’m a hypocrite? Well you should. I wouldn’t disagree with you. Money is the Mc-mansion in Sarasota that starts falling apart after 10 years. Power is the old stone building that stands for centuries. I cannot respect someone who doesn’t see the difference. I feel exposed. Like the skin where my ring used to be. Even Achilles was only as strong as his heel. He doesn’t measure his wealth in private jets, but purchased souls. Did you think I’d forgotten you? Perhaps you’d hoped I had. Don’t waste a breath mourning Miss Barnes, every kitten grows up to be a cat. They seem so harmless at first–small, quiet, lapping up their saucer of milk. But once their claws get long enough, they draw blood, sometimes from the hand that feeds them. Politics is no longer theater, it’s show business. So let’s put on the best show in town. She can go after me all she wants but if she goes after Clare I’ll slit her f*cking throat in broad daylight. I know you take a lot of pride in your manhood, Bob, it’s impressive. But as big as it is, Linda can still shut the door on it. Such a waste of talent. He chose money over power. In this town, a mistake nearly everyone makes. You might very well think that. I couldn’t possibly comment. I hope she comes out of her tree before I have to bring out my axe. Nobody can hear you. Nobody cares about you. Nothing will come of this. One heartbeat away from the Presidency and not a single vote cast in my name. It only takes ten seconds to crush a man’s ambitions. Power is a lot like real estate. It’s all about location, location, location. The closer you are to the source, the higher your property value. There can be no false steps now. The higher up the mountain the more treacherous the path. The nature of promises, Linda, is that they remain immune to changing circumstances. 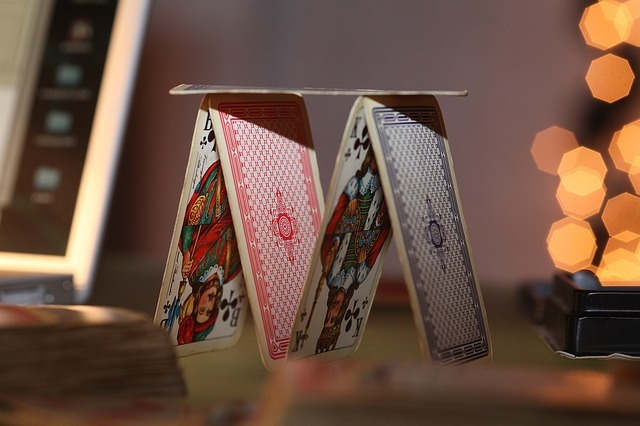 The best thing about human beings is that they stack so neatly. He’s in the darkness now. I am his only beacon of light. Now we guide him gently toward the rocks. You keep track of all of her movements – visitors, names, times, the color of their sh*t and how much it stinks. The only problem with common sense is that it’s so common. I know why we’re smiling. We survived. Moments like this require someone who will act. To do the unpleasant thing. The necessary thing. I just happen to be white trash that lives in the White House.